The climbing cost of energy is driving utility bills higher every year. Learn how energy efficient lighting can save you lots of cash every month! With the cost of living climbing every year cutting down expenses has become even more important. Everything has been getting more expensive especially energy costs. These costs have been going up and down for a few years sadly, they go down a little only to climb even higher months later. There is nothing more stressful that watching the power bill go higher year after year while your income remains the same. One of the best ways to save money monthly is to cut down the power bill. While this may sound like a difficult task it really is not but, it may require some form of investment. In this article you will learn about energy saving light bulbs and how they compare to regular incandescent light bulbs in terms of efficiency, power consumption, and lifespan. Did you know that for the most part the differences in energy efficiency among light bulbs is attributed to how much of the energy received by the lamp is released in the form of heat? When a bulb lights up some of the energy is converted to visible light, what is left is transformed into heat and other wavelengths that are at the extremes of the light spectrum and are not really useful to us. Inefficient lighting not only raises the temperature of a room, it also makes air conditioners use more power in order to bring the room to the desired temperature which results in an even higher utility bill. These are the classic light bulb we see in most homes. The are very inefficient and have a very short lifespan. Light in incandescent bulbs is created by passing a current through a small filament. This filament produces visible light. The problem is that most of the power that enters is transformed into heat. To make matters worst, depending on how much they are used they need to be replaced relatively often. The good thing is that they are cheap and can be purchases almost anywhere. Cheap when it comes to the price paid for the product. In terms of efficiency, they consume a lot of power which manifests as a higher utility bill. They produce the lowest Lumens per Watt among the three types of light bulbs that we are discussing at around 17 Lumens per Watt. Their lifespan is around 1000 hours. CFL light bulbs use a lot less energy that incandescent bulbs use. A 13W CFL can produce the same amount of Lumens than a 60W incandescent. In other words, the use 78.3% less power for the same Lumens. The typical compact fluorescent lamp emits from 50-60 Lumens per Watt. They are a little more expensive than regular light bulbs but their lifespan is eight times as long. The typical lifespan of a CFL is around 8000 hours compared to a regular bulb which only lasts about 1000 hours at most. The price of compact fluorescents that are similar to a regular 65-100W bulbs range from $5-$8 dollars depending on the manufacturer, type of light produced (cool while, warm) and quality. The downside is that they need a minimum amount of current to work and their lifespan is affected by repeated switching on and off. Most CFL are not suitable for dimmers. They contain mercury so they need to be disposed properly when replaced and some precautions need to be taken if the lamp breaks. LED light bulbs are the best source of light that money can buy. They are very energy efficient and have a very long lifespan. Some lamps can last up to 30,000 hours of use. In case you are wondering, LED stands for light emitting diode. They are to be found anywhere where home entertainment devices sit around the house because they have been in use for years as indicator lights for video game consoles, monitors, computers. DVD players as well as back lighting for HD televisions, smart-phones and many other gadget that require lights that don't use a lot of power and that last many years. Their cost is higher than other light sources but because of their extremely long lifespan and low energy consumption they are definitively worth the extra cash. 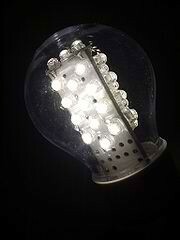 Typically, LED light bulbs are a lot less fragile than regular lamps therefore more resistant to shock. Constant On an Off switching doesn't affect their lifespan either, what can affect their performance is the temperature of the rooms that they are installed in but this is not usually a problem. They are constructed using a cluster of small LED units that are spaced out inside the bulb in order to create the necessary light spread to light up the room and minimize the directional properties of individual LED units. Over the years the cost of these lamps have gone significantly, bulbs that cost around $30 have been selling for $20 or even less. While a $20-$30 cost may look like much at first over its lifespan a bulb will pay for itself a couple of times and even more if you take into account the replacement cost of other lighting options. While the initial investment of changing most of the bulbs in a house to LED might seem a lot at first, the amount of money saved per year is enough to offset the cost of the investment not to mention that they last a decade. A house equipped with LEDs instead of incandescent lamps can mean savings of more than $500 a year or even more depending on the habits of those who live there. A business using this type of lighting can save a few thousands a year. As for Lumens per Watt, some of them are able to produce 100 Lumens per Watt beating any type of lighting including fluorescent lamps. No, but planning to upgrade. Usually the mercury inside CFL lamps is in the form of vapor but it is still dangerous. These bulbs are not supposed to be discarded in the trash. They should be discarded in places assigned by the government. Sadly, very few people know about this. Mercury is very poisonous and even if its in the form of a gas, residue left inside a broken bulb can effect humans in one way or another with sufficient exposure. Another thing is that it can end up in lakes, rivers and eventually tap water and fish. If one of these bulbs breaks the best thing to do is to use gloves to pick up the pieces. Don't allow anyone in the family to touch a broken CFL bare handed especially small children or pets if you have any. The good thing about many LEDs is that many of them (not all) have a shell made of plastic or a plastic like material that makes them resistant to shock in case one of them falls to the ground or is hit by an object for some reason. I have just started using an LED light bulb in my kitchen. I have several CFL lamps, but the idea of the mercury inside has turned me against them. If a child were to knock over a lamp accidentally, what then? I don't think it's worth the risk.